The SolaRoad pilot cycle path alongside the N203 near Krommenie, in the Netherlands, was opened in October 2014. It is 90 m long and 3.5 m wide. The path was built by a consortium consisting of the Province of Noord-Holland, Strukton Civiel and applied scientific research organisation TNO. SolaRoad is exactly what the name suggests – a bike path with integrated solar panels, which harvests sunlight and converts it to electricity. The green electricity generated by a SolaRoad can be used for various purposes, such as public lighting, traffic management systems, households and electric mobility. In the Netherlands there is 600 km2 of road surfacing, which is more than the available roof surface. Solar roads can, therefore, provide extra capacity for generating green electricity without claiming extra space in densely populated areas and without being an eyesore. During the course of the SolaRoad project, three different versions of road were tested. A number of trials were carried out involving the composition of the top layer, solar panel design and solar cell technologies. It was found that the top layer is crucial to the path’s success. In addition, the top layer has to be sufficiently skid-resistant to guarantee safe use by road users. The SolaRoad project has shown that the light transmission of the top layer decreases somewhat over time due to climatic influences. The top layer also showed some local delamination, where smaller sections of the coating chipped off the surface. Major improvements were already made to the development of the top layer during the pilot project. 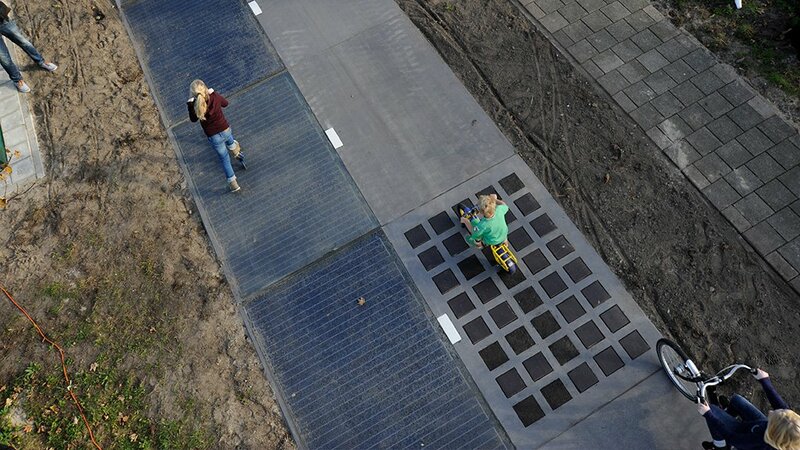 According to the consortium responsible for SolaRoad, the project parametres demanded that riding on a solar road should be no different from using a normal road. It should also be possible to manage the road just like any road, with no amended cleaning regime required. It was found that regular rain showers washed away the dirt and that the road surface, therefore, remained sufficiently clean. The consortium responsible for SolaRoad in July published some new results from the long-running bike path project. At the start of the trial, an energy yield of between 50 and 70 kWh/m2/year was expected. However, this figure turned out to be higher in the first year, at respectively 73 kWh/m2/year (first version, built in 2014) and 93 kWh/m2/year (second, improved version, built in 2016). Owing to the decrease in the light transmission of the top layer, the yields, in time, decreased to the expected range. With the application of thin film solar cells in two portions of the test path, valuable experience has been gained with this type of flexible solar cell, notes the consortium. It is expected that this thin film will eventually be more suitable for use in road surfaces than the brittle silicon cells used in the rest of the cycle path. The current efficiency of the flexible cells is, however, lower than some other applications, as evidenced by the yield measured of about 41 kWh/m2/year, but it is expected to rise considerably in the coming years, as the technology improves. “The results of the SolaRoad pilot in Krommenie are a confidence builder in the opportunities for solar roads as a valuable building block in a sustainable energy supply,” notes the consortium responsible for the project. New pilots are being planned for the beginning of 2019. SolaRoad will be demonstrated on roads exposed to heavy traffic at two locations, namely in North and South Holland respectively. The aim of the pilot is to study the performance of the pavement under heavy traffic loading, and to learn about the impact of solar pavement on daily road management and maintenance. In addition, it is being investigated how the energy yield can be further maximised. “It is time for the next step. Valuable lessons were learnt from the pilot in Krommenie,” says Province of Noord-Holland mobility vice-governor Elisabeth Post. The test location with heavy traffic in Haarlemmermeer will be set up as a living lab, integrating the SolaRoad pavement into the public road. The facility will be built in stages, to allow the testing of different materials. The Noord-Holland provincial executive is providing €2.7-million in funding to the pilot project and its associated research and development.